You may have noticed – I’ve been AWOL from this blog. 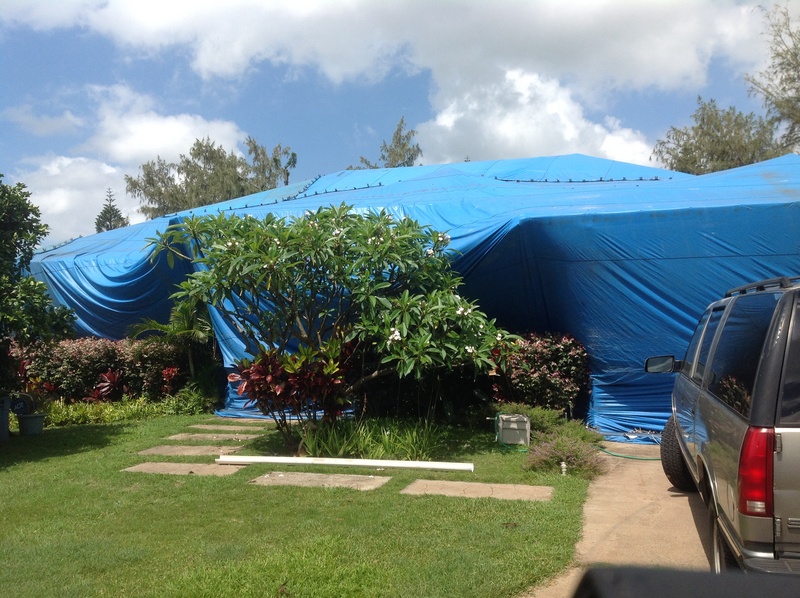 If death and taxes are two inescapables on the mainland, then you must add a third when you live in Hawaii: termites. We had to move out of our house for two days while the house was tented. Our bank account is sickly. I have MCS (multiple chemical sensitivity), which means I am like a canary in a mine. When any type of toxic substance is introduced to my environment, I go down for the count. In 2009 we tried to go to the organic route, with orange oil. ($3,000.) 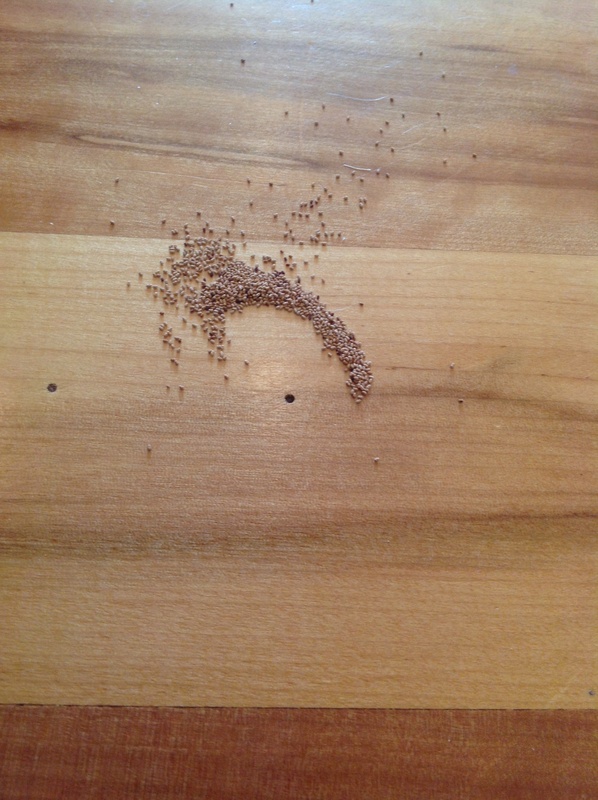 It seemed to help for a while – they drilled tiny holes into our wood floors and poured orange oil inside. I crossed my fingers. But they returned. The problem with termites of course, is that you don’t see the damage they’re doing until it’s too late. By the time our floors were buckling and cracking in places and the termites were starting in on our kitchen cabinets, I broke down and called the exterminators. The big local guy who came weighed at least 350 – maybe more, and when he got down on one knee to examine the damage, I heard a sickening cracking sound. Another floorboard bit the dust. 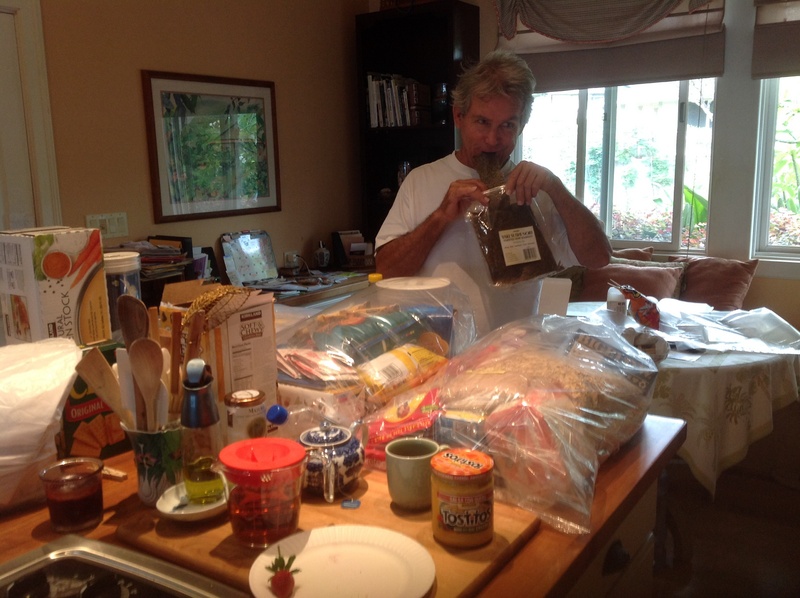 All the spices, all the baking goods, dry goods: crackers, cereal, pasta, etc. ; coffee, tea and liquor; all the condiments in the refrigerator (!) ALL the food in the refrigerator, all the food in the freezer. Double bagged, every bit of it. And we have two refrigerators. All the sunscreen, makeup, toothpaste and toothbrushes. All the vitamins. 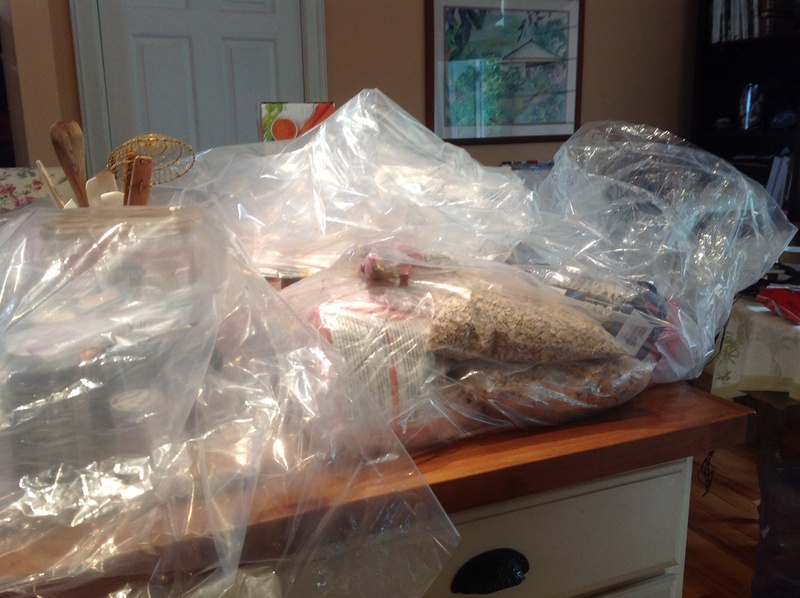 All the medications, double-bagged. The cat food…Essentially anything that would go in anyone’s mouth or touch their skin. As Higgins used to say on “Magnum, PI” OMG. By the time the tent went up over the roof, we had spent two full days preparing, and I started calling it the circus tent. Imagine what this does to the weekend of a working couple. Now find a place to stay, with cat, dog, kids…for two days. That’s noxious gas, plus teargas that they pumped into the house…your living space. 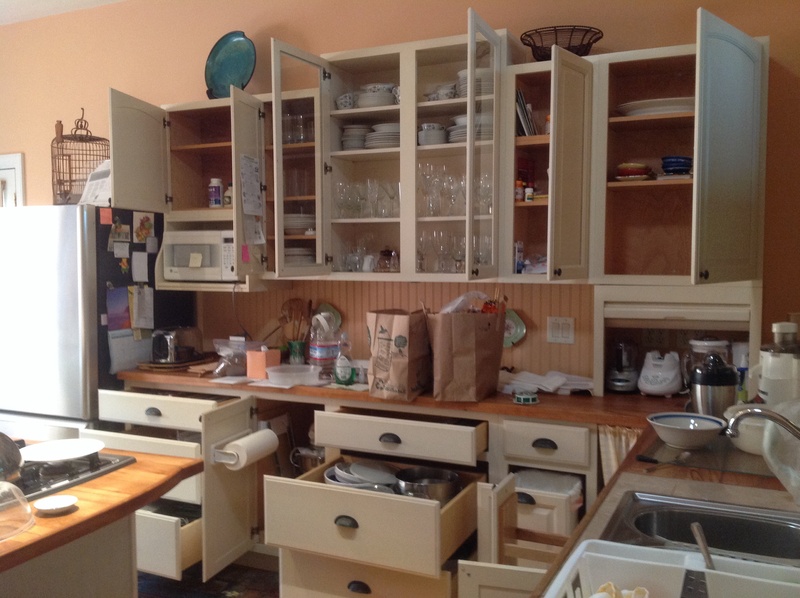 That’s why all the cabinets and drawers must be left standing open. Just eewww. Of course we were dying to get back into the house, if nothing else to get all the things we forgot to take with us, except everything was in BAGS and we couldn’t find anything. Then it was a full day of UNpacking. We spent $3,725 for the pleasure. Goodbye, vacation. No one escapes termites here. Even if you lived in a concrete bunker, you would still have some wood furniture and wood kitchen cabinets. The price of Paradise? You bet. Now I understand why the early Hawaiians lived in grass huts! A hui hou! Mahalo for reading along. If you’d like to stay in the loop, please click the “Follow” button to the right. 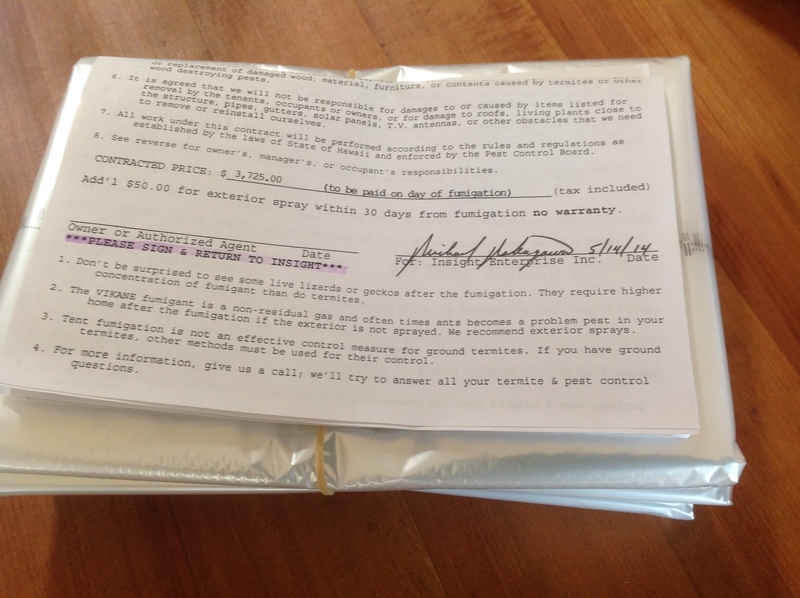 This entry was posted in Life in Hawaii and tagged MCS and termite treatment, multiple chemical sensitivity, sick from termite tenting, termite tenting, termites in Hawaii by jamaicawtr. Bookmark the permalink. Omg. So sorry – no fun! I’ll bet you’re glad it do tho! Yes, very glad it’s over. We should get 5-7 years out of the treatment. Glad you are able to come to Maui in Feb. I remember when living near Chicago, February was the month when you were already over winter and couldn’t wait to be out of there. How awful to have to deal with the termites and the chemicals. Hope your home is aired out. I am curious what you ended up using for your termites? I, too have fibromyalgia and multiple chemical sensitivity. Did you find a good alternative?